As you may have realized by way of repeated requests from website owners asking you to remove specific outbound links, Google has definitely cracked down on links that it perceives as unnatural or bad. However, these requests may have compelled you to make time from your busy schedule and dedicate it to removing all requested links. Well, not anymore. You can now outsource this time-and-energy zapping chore to an efficient link removal service firm so that all requested outgoing links are removed by the firm. Google has decided to punish all sites that have indulged in using paid links, links that are linked to spam websites and sites with low authority, and links present on duplicate articles and duplicate anchor text, among other criteria. Websites that have managed to insert such links that have been deemed bad or unnatural by Google are sure to notice a downward trend in rankings with each passing day. Other sites may fall victim to a manual review by Google engineers and may receive a manual penalty warning them to clean up all bad links and resubmit their website details to get ranked once again. Sites that may have engaged in cleaning up their links may have contacted you to remove any links present on your own site in case they are present in blogs, articles, etc. However, such requests require you to dedicate a lot of time and energy, which you can ill-afford in these fast-paced times. Well, a solution exists in the form of an efficient link removal service firm that can remove all requested links from your site. You merely need to visit the website of SEO Engine Optimizations at http://seoengineoptimizations.com/link-removal-service/. The best part is that this firm will not charge any fees from you to remove the unnatural links. Fees are charged in very nominal amounts from websites that request you to remove the specified links. On your part, you only need to create a log in for all blogs that need to be utilized for link-removal or you can just allow the service firm to make use of your own log in. In addition, a mail template needs to be created on the precise way to use the link removal service offered by this efficient firm and reply to all incoming requests by using this template email. This link removal firm can help remove link keywords as well as complete URLs where the link may be located. SEO Engine Optimizations charges a very small fee per site. While the fee is nominal for the first link removal, fees for removing subsequent links is even smaller. Hence, both you and the requesting websites benefit from the services offered by this professional link removing service firm. So, do not waste your precious time in link removal activities that may never end since you may continually receive such requests. A time-saving and cost-effective idea is to merely visit the above website of SEO Engine Optimizations and allow this efficient link removal service firm to remove all requested links from your site. You may have encouraged guest bloggers and authors on your website, who may have posted content along with outbound links on your website. However, with Google getting strict on several link building activities, those very same guests may now be badgering you to remove those links. Google continues to release new search engine algorithm updates that have focused on backlinking. Hence, if Google feels that a website has opted for paid links merely to enhance rankings or has inserted links leading to unrelated sites or has a high number of backlinks in duplicate content and duplicate anchor text then the algorithm takes swift action. Website owners with links to dubious or low quality sites along with the above breaches of Google Webmaster Guidelines may have found that their rankings have slipped with each passing week. Some of them may have also received an email stating that they have been slapped with a manual penalty due to their linking strategies. Such sites, in turn, would have sent you repeated requests to remove links present on your site. You may be faced with a tough choice of ignoring such requests and damaging your relationship with all such site owners or wasting your time in removing all links as requested by them. However, there is a better way out since you merely need to contact a capable link removal service company that will remove all required links for free. Yes, you need not waste any time or pay any money to get these unnatural or bad links removed when you contact an experienced link removal service company such as SEO Engine Optimizations. The process of allowing this efficient link removing firm is very simple. You can give your log in to your blogs to the above company or create a log in for all blogs that need to be used by the company. In addition, you need to create a template of an email explaining the way to use this link removal service and reply to all your requests by way of this template email. Finally, you can just forget about these requests as they will be handled by SEO Engine Optimizations. This link removal service company charges a small fee from the website owner that has requested you to remove the outgoing links. In this arrangement, everyone is a winner since you can now focus on your own matters instead of spending time and energy in removing links that were actually asked to be inserted by guest bloggers in the first place. The website owners to can get all such unnatural links removed quickly thanks to the efficient services of SEO Engine Optimizations. Google too will be happy only when such links are removed. New Google search updates may have flustered many site owners. But you need not get flustered if you receive continuous link removal requests from several sites owners once you have a capable link removal service company to handle all that tiresome work. You should quickly contact SEO Engine Optimizations at the above mentioned website and forget about the inconvenient chore of removing bad or unnatural links on your own. TIP! When setting up pages using SEO, it is usually better to have multiple short articles on similar topics than to have one extremely long article. Long pages are weighted less highly than short ones by search engines. TIP! When setting up a page using SEO techniques, don't be tricked into thinking additional advertising will boost your search engine ranking. Although advertising on other sites may drive traffic to your site and thereby increase income; it will not boost your rankings. When setting up a page using SEO techniques, don't be tricked into thinking additional advertising will boost your search engine ranking. Although advertising on other sites may drive traffic to your site and thereby increase income; it will not boost your rankings. To hide something, create a robots. txt file, which must be added to the root directory. This tells the search engines that these files are not to be accessed. TIP! To make a specific page of a website more search engine friendly, include keywords in the page's URL. If the URL contains numbers or symbols that people are unlikely to search for, the page will be less likely to get high search engine rankings. After choosing which keywords are best for your site, get as many as you can in your web page's title. Spend some effort making your title good, since that's what shows up on search engine results pages. If you do this, your website will closely correspond with users' queries. TIP! Invest in online advertising like adwords or adbrite. Do it yourself search engine optimization may sometimes not be enough to see a significant increase in rankings. Descriptive introductions help search engine spiders better catalog your site. Use 60 characters of fewer because search engines typically will not display any more content than that. They also tend to give less weight to terms after that point. To make a specific page of a website more search engine friendly, include keywords in the page's URL. If the URL contains numbers or symbols that people are unlikely to search for, the page will be less likely to get high search engine rankings. Including important keywords that are relevant to your site will significantly improve your page's traffic. TIP! A great way to improve your search engine optimization is to use keywords within your HTML tag. Search engines place the more weight on words and phrases used in title tags than on any other words on your pages. Research keywords before you begin. Find out which keywords you need to focus on when building your website and titles. This allows you to know what potential visitors are looking up in your category. You should highlight these keywords so you can become higher in rankings. TIP! Don't dump a bunch of links on a single page without any context. The links you place in your copy should flow naturally. TIP! When working on search engine optimization, it is very important that you always write content for humans first. It is certainly important to include keywords in your text so that it is picked up by search engine bots, but remember, that these bots have never purchased anything. Focus on becoming an expert in just one or two aspects of SEO right away. Trying to learn everything all at once is impossible, and will cause you a lot of stress. Chose a technique that looks like it will work for you, and look into that as much possible. Once you have learned one technique fully, you can then start working on a different one. TIP! On-page Search Engine Optimization (SEO) is extremely important in marketing your articles, so do your research and optimize your site. A high Google rank is the difference between being found by potential readers and being overlooked, so make sure your layout is fully optimized to meet and exceed current SEO benchmarks. You should avoid creating entire pages that are filled with nothing but links. You should do all you can to make your links an integral part of your website's content. Pages that are filled with links are often ignored by readers who often find them boring. Many search engines do not rank these pages favorably. Including your links within your text gives search engines the ability to index your content and also give your site a professional style. TIP! Here are a few of the methods you should consider to attract high-quality inbound links: directory submissions, blogging, press releases and writing articles. SEO success depends on having good links. TIP! When designing your website, it's important to know that spiders cannot read dynamic language or session ID names. Meaningful URLs and relevant keywords make it easier for the search engines to read your pages. To boost your traffic or monetize your site, search engine optimization really can be key. It makes your website appear near the top of search engine results. To learn more, check out the article below. TIP! Have you considered using a product feed in order to promote your website's presence to a wider audience? This could lead to a growth of your clientele. The feeds can give info to your clientele, including descriptions of products, prices, and even images. Assist the web spiders in their mission if you expect to be ranked highly. Spiders analyze your site, looking at things like keywords. However, they don't always grasp how to navigate around your site. Create a site map that clearly indicates a hierarchy of pages, so that the spider will be able to index your site more accurately. TIP! Improve the content on your site at all times. Visitors do not stay long on a site if they are not gaining information, which means getting relevant content that will drive traffic. Try creating robots text file in your root directory to achieve this. txt file and inserting it in your site's root directory. This will keep search engines from gaining access to the files you choose not to display. TIP! While you can do a link exchange with others, it's a good idea to focus on article exchanges with other website owners in order to raise your site in search engine rankings. This basically means that you will use an article created by a different website owner, and post it on your website. After you chose the keywords you are going to use throughout your site, be sure to use them in the title of your webpage as well. Choose a smart, appropriate title that will give users arriving at your site a good first impression. If you do this, your website will closely correspond with users' queries. TIP! Creating a site map can really have a positive impact on your business, as search engines are able to index your pages more easily. Navigation bars, also called site maps, help search engines locate an individual page through another area of the website. When trying to boost your traffic, try adding a site map. This sitemap page gathers every link on your site, all in one place. When visitors notice the links on your page, it can significantly increase your site traffic. TIP! A site map is an important tool; remember your keywords. A site map is an easy to read, easily accessible directory of every area on your website. To garner higher search rankings for your site, understand the benefits and uses of social media and use these free sites to get noticed. Most of them are free to use, such as Twitter, Facebook or even the online review sites. There are also online groups and websites for people with certain interests that can help your website achieve recognition. Join any that seem relevant to your niche, and use it as a method to promote your services or products and improve your ranking. TIP! Avoid duplicating content if you don't want your content considered spam. Know that you are possibly using duplicated content without knowing it. Always try to make sure that you have good description tags. A good limit to set yourself is around 30 words. You should never go higher than 100 KB on the page. TIP! It is worth your time to see if you could add podcasts to your marketing mix. A podcast can include audio or video content that includes relevant, interesting material directed at your consumers. Begin by doing ample keyword research. Wisely choose which keywords to use on your website and in your titles. You can find out which keywords people search the most. Keeping this content highlighted helps raise your search engine rankings. TIP! Utilize your title tag properly. As people enter into your site, they will notice the title tag first. Duplicate content will subject you to spam filters of the search engines. Know that you are possibly using duplicated content without knowing it. For example, product descriptions on numerous pages can be considered spam. TIP! There is room for improvement on every website. You need to be aware of this if you want to fix the problems that lie within your own website. Try to embed videos onto the homepage of your website. You can make use of videos for general introductions or to create video reviews. Keep the video posted on your site with proper labeling using keywords. Google Webmaster Tools will allow you to submit your URL. Then, post on other sites, such as YouTube. Then, you can relax and wait for visitors to arrive. Optimization may not be quick, but it is easy and free. Using the tips here can boost the popularity of your site after they've had some time to work. Apply the tips you learned here today if you want to get ahead of the competition. TIP! Above all else, you site has to entertain people and keep their attention if you hope to have a successful web business. SEO consists of getting people to spend time on your site as much as visiting your site. An important component of running a successful business website is utilizing top-notch search engine optimization methods. Take the time to understand how search engine optimization ensures that popular search engines place you on the top of the list for potential customers who are looking for your services. Read the below article in order to discover more information on this concept. TIP! Use header tags to your advantage. Headers can sometimes be too large, but CSS can be employed to adjust sizes. TIP! Put forth the image of an expert in your field. This is a great way to get more customers out of your internet marketing campaign. When optimizing your search engine results be sure to use any variation of the word possible, including misspellings. Search engines will be able to see these meta tags and you will show up in a much larger amount of searches. For example, if your site is about eyeglasses, include in your metatag both "glasses" and "glases," "eyeglasses" and "eye glasses," etc. TIP! Talk with an education or non-profit website to see if they will provide a link on their site to content on your site. Search engines look at results from these sites differently and rank them higher because they are considered reputable sources of information. TIP! As a first step, conduct research about keywords. Before building your website, know which keywords should be included in the titles. Try switching to writing in search engine optimization style to enhance your search results. This means repeating keywords as much as possible without breaking up the flow of the writing. Your search results should improve since it works by examining the density of the keywords it has found. TIP! Your website might be great, but it surely isn't perfect. Understand this, and you will want to improve your site daily. You need to put some thought into the anchor text you use for internal website links. You should describe what the page is about and give a good reason for your reader to click on your anchor text link. Ensure the right text is used as the keyword, so you receive a rise in ranking. Good keywords in your anchors will get you noticed by the spider crawlers. Do this by forming a robots. txt file that goes into the root's directory. This prevents the search engine robots from indexing certain pages of your site. TIP! Talk about current events and their relation to the products you are selling. This will help you get visitors that were searching for an unrelated topic. See if an informational site or .org domain will trade links with you. Search engines like to see these credible relationships. Ensure that the quality of your content is high, and you may attract reliable, professional organizations who want to feature a link to your site on their own. These companies must find your content informative. TIP! Use services that don't block domain information. If you get your domain registered with Google while it has blocked your information this could get you labeled as a spammer and you won't get good traffic. It is possible for you to take a DIY stance by learning a few pointers about how to do SEO well. There are plenty of resources available online to help you learn. You can look at tons of terrific websites and books as well. TIP! If you use a shared server, you must ensure that you do not share a proxy with a site that engages in unethical practices or is otherwise banned. Sharing a proxy with a banned site or a site that has been deemed spammers could negatively affect your ratings, and thus not get you the traffic you desire. Groom your site for easy readability. To gain higher search result rankings, create a website that is clear and easy to read. 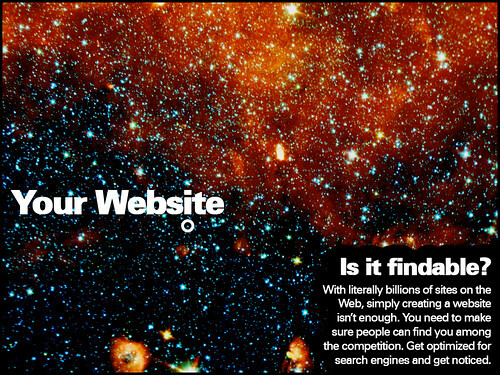 Your site should not only be easy for readers to use, but for search engines as well. TIP! Consider using the services of a company that specializes in search engine optimization. Search engine optimization is a special kind of marketing that focuses on increasing the prominence of your site in search engines. Google has embarked on a mission to rid the World Wide Web of unnatural links. Its recent updates including the Penguin update has penalized countless websites that were deemed to have unnatural links or those that Google determined were not adhering to Google Webmaster Guidelines. Many sites have noticed an unnatural downward ranking of their websites or have received a manual penalty from Google warning them about unnatural links to or from their sites. Google will not restore rankings until those sites can prove that they have acted positively to remove all bad or unnatural links. You may have already received requests from specific website owners asking you to remove links leading to their sites. Before these various Google updates, you as well as other sites may have not even thought about unnatural links. These are links for which a site may have paid money for or links that they may have inserted in websites that Google now considers as dubious or spammy sites, or sites that command very less authority. Any form of linking that is not considered natural by the new updates of Google is now considered as unnatural. Once any website has been identified as having unnatural links and has been warned by Google then the website owner needs to follow a tedious process of auditing all links, identifying the bad ones, and removing them. If the site has hundreds or even thousands of links to various webpages or websites then this process could take up a lot of time and require a lot of effort too. If several websites have requested you to remove links then rather than wasting time or effort in identifying links on the blogs section of your website, you can easily avail of link removal services that can do the same on your behalf for free. You can merely visit http://seoengineoptimizations.com/link-removal-service/. This service providing company will remove links for free. The company charges a small fee from website owners that want the links to be removed instead of charging you. If you are a blog owner with outgoing links then you merely need to give your log in to the service provider. On the other hand, you can trust the link removal service provider and can allow them to use your own log in. You will also need to create an email template on the right way to use the service and forward all requests to the link removal provider. Such a service provider will normally charge a small fee from the site owner for the first link removal and then a much smaller fee to remove all subsequent links. The site owner can request the service provider to remove offending keywords and URLs too as per their needs. Once the link removal service provider removes all unnatural links then the site owner can make a re-inclusion request to Google in case of a manual penalty or wait for rankings to recover in case of an automated penalty. So, do not waste your precious time in removing unnatural links when you can easily contact a professional link removal service provider and do the same for free. TIP! When you use SEO, you should make sure you site is properly coded. When search engines see coding that is not well done, they will pass it up. If you have more people visiting your blog or website then you receive more pay. Increasing this traffic is important. Search engine optimization can help you create a more accessible website. Read the following article for some great ideas on how to improve your SEO. Several articles on different topics are better than one long article on your website. Long pages get weighted less than shorter ones by the search engines. Additionally, visitors aren't likely to read through articles that are very long. Search engine optimization can be improved by switching your style of writing from AP to SEO. This style simply means increasing the number of times your keyword is repeated without disrupting the writing flow. This improves your rankings by increasing density, a factor used by many search engines. TIP! Search engine marketing and social media marketing go hand in hand, so don't forget to take advantage of both tools. You may assume that you don't need to go beyond Twitter and Facebook, but that's not true. Make sure you use header tags. They may sometimes be too large, but using CSS can help you change their sizes. Since search engine use headers in the ranking of websites, these tags are very important. If you have useful bits of information, mark them in an H1 or H2 tag. Try creating a robots. txt file, which must be added to the root directory. The search engine is then unable to access selected files featured on your site. TIP! Create original content frequently, and publish it to your site. Set a goal for yourself, and follow through on it. Focus as much on keeping people on your site as you do to get them there. This will, in turn, assist in your PageRank numbers. There is more and more evidence available suggesting that how long a visitor stays on a site affects their PageRank, according to Quantcast scores. It has an influence on your site's PageRank. You can use discussion groups and forums to convince visitors to stay logged in to your site for a longer time. TIP! Don't use a ton of keywords. 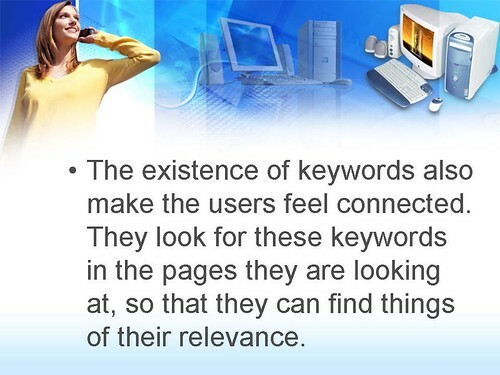 Focus the site on a few, deliberately chosen keywords with the most relevance to your topic. So you can do this all by yourself and use the advice here to help you with SEO. There are many resources available to help you learn about it. There are several websites that can be helpful, as well as really excellent books on the topic. TIP! Don't use any service that blocks the information about your domain ownership. Registering your domain with an entity like Google only to have it blocked will not get you the ranking results you want. Boost the rankings of the search engine with article exchange instead of link exchange. To do this, you would post someone's article on your site with a link back to them, and then they can do the same thing for you. Since both sites get new content out of the exchange, it is much more effective than simply exchanging links. TIP! If you want to get your articles out there, on-page SEO is crucial. If you want more readers, you have to rank highly. TIP! Search engines are very smart; if they see you are trying to manipulate your site fraudulently, they will suppress your pages. Occasionally the more prominent search engines like Google and Yahoo have even banned certain companies from their search results altogether! Make yourself aware of what is ethically sound when it comes to SEO. TIP! Blogging is a good way to regularly add fresh content, which is beneficial because search engines' bots are attracted to newer material. Also, if the content you publish is high quality, it'll be shared by others. Web sites most likely to have the most traffic are those that show up in the first few pages of search engine results. Use the tips you just read to help attract visitors to your website or your blog. SEO can make huge changes to your visitor numbers in a short amount of time, so get to work!